I have set up shop in San Diego for the next 3 months. Take a look at www.devondevereaux.com for new paintings and new store items. I’m working on setting up some shows in southern California. 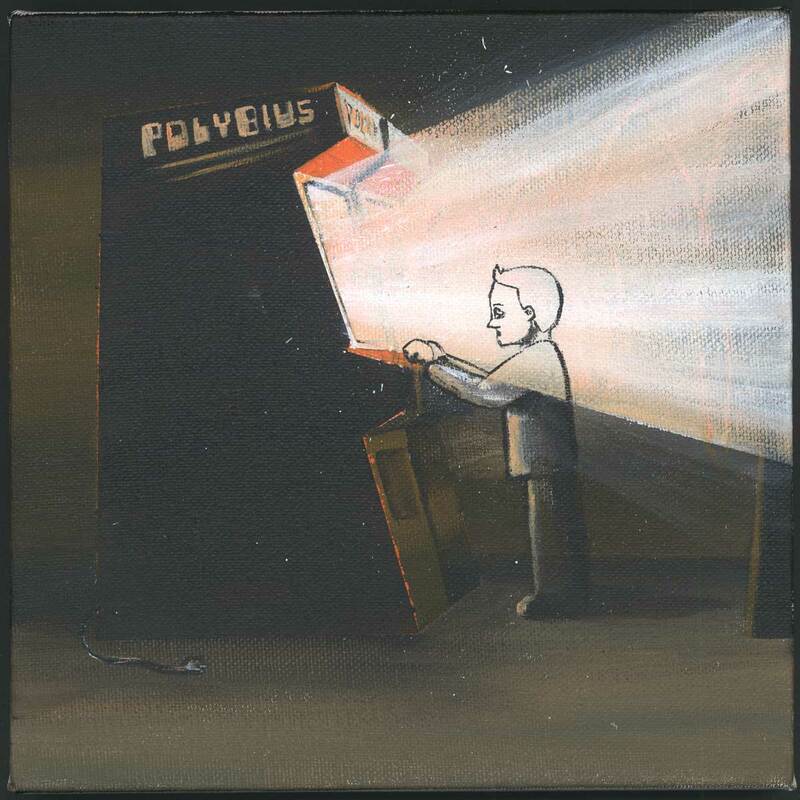 According to legend, in 1981, there were two arcade consoles released in Portland, OR called Polybius. Customers came into an unnamed arcade and played this game. They began to have seizures, fainting and experienced psychotic behavior. Depending on what story you buy into, there were men in black that allegedly removed the two games days after its release. This seems to be an urban myth based on some kernel of truth. There were reports in1981 of an unnamed arcade game with customers having similar experiences. Since then the game has shown up in an episode of the Simpsons and has become a part of modern pop culture. 8″ x 8″ acrylic on canvas by Devon Devereaux. 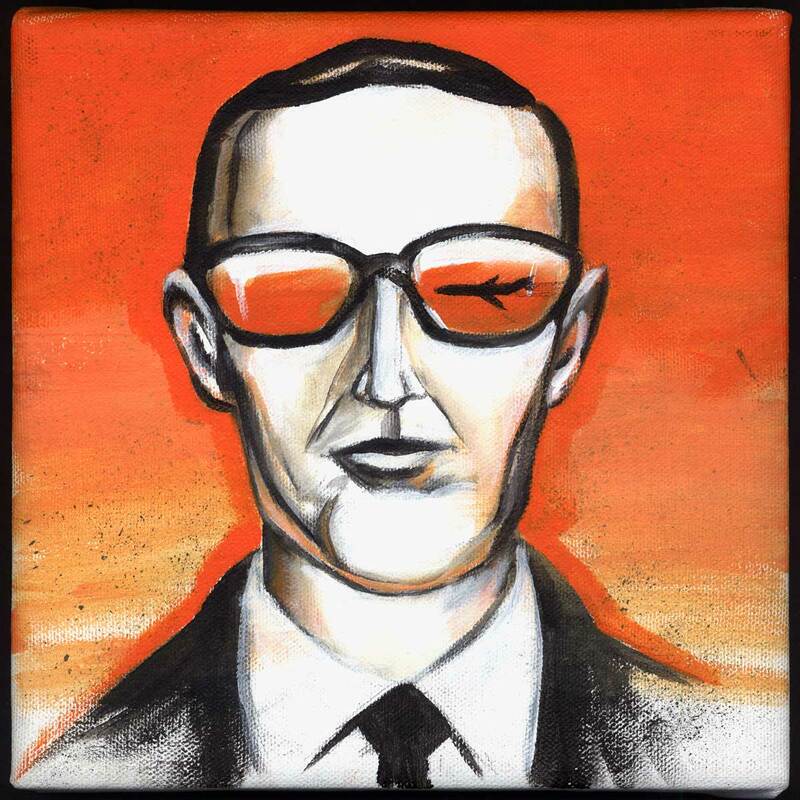 On November 24, 1971 A man Identified himself as Dan Cooper hijacked a Boeing 727 from Portland, OR flying to Seattle, WA. To this day he has not been identified although many weigh in on who he might have been. 8″ x 8″ acrylic on canvas by Devon Devereaux. Available on ETSY. On May 11, 1950 Evelyn and Paul Trent spotted a metallic disc shaped object. 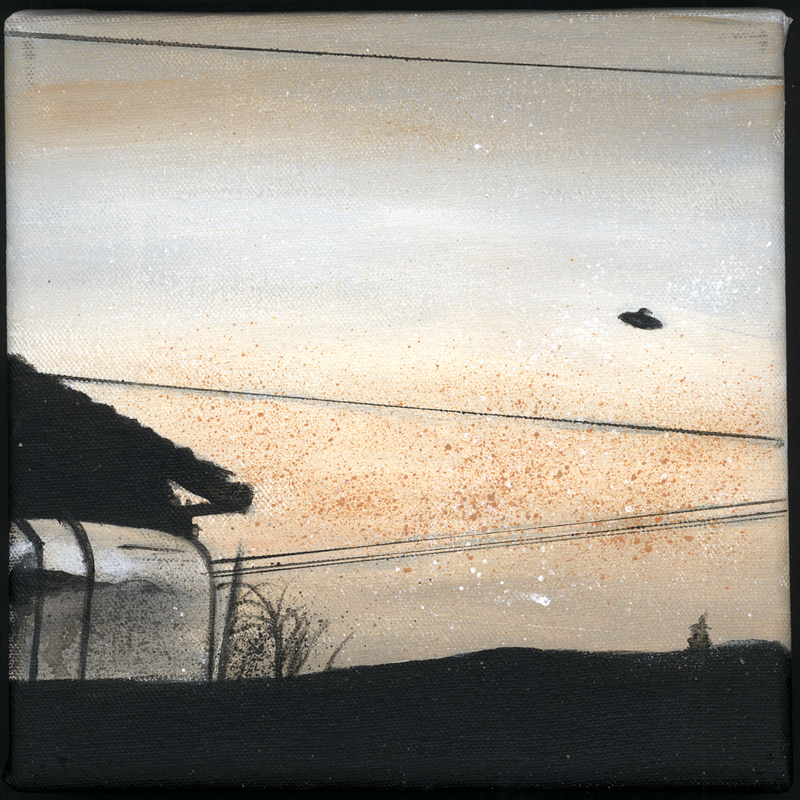 They were able to take two photos of the scene before the saucer disappeared. Each year during the month of may there is a UFO festival including a parade and other special events to mark the event. 8″ x 8″ acrylic on canvas. Available now on ETSY. Since 2012, Every October I try to create one painting every day. The first year was all Halloween art. Last year was Cinematic Dracula paintings. This year will be a new legend, curse, folklore of the Northwest. Up first is Ogopogo. There are mythical sea serpents all over the planet. The Ogopogo is a Canadian legend that has been seen on Lake Okanagan in British Columbia. It is said to be very similar in shape to Scotland’s Loch Ness Monster. 8″ x 8″ acrylic on canvas. Available here on Etsy. Josh Lobster Kickstarter is live. Josh Lobster written by Chris Reilly, illustrated by Devon Devereaux is the story of Josh and his sidekick Misty exploring the secrets of Goose Cove, Rhode Island. The traveling carnival comes to the island every year. But this year something strange is afoot. The worlds population of sea life are making their way to Goose Cove. New evidence of 20 year old murder comes to light. 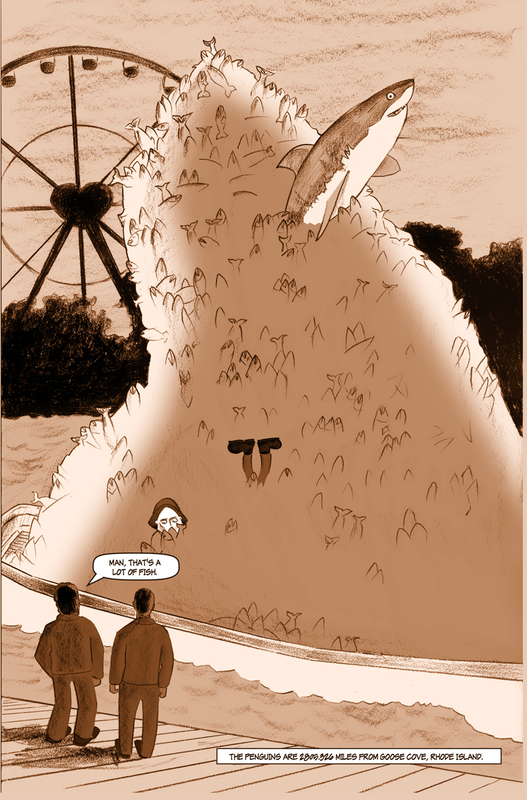 Vampires attacks on the island cattle and the mysterious Barnacle Bill seems to be at the center of it all. The last conversation Chris and I had was about how to do the Kickstarter video. We tossed around a lot of ideas and we both agreed on JAWS as our theme. Unfortunately Chris passed away suddenly on June 10, 2014 right as I was completing the art for the first issue. I wasn’t sure what to do but I know Chris would have wanted folks to see his final story. Vincent in the Tiki Caves 13″ x 19″ Giclee print is now available through the Devon Devereaux Illustration ETSY store. This is the first officially licensed piece of art I have created for the Vincent Price Estate. Get yours today before they sell out! Chris Reilly was my Quint. If you have never seen Jaws, Quint is the salty old New England fisherman who lived a life of unbelievable stories. Along with Chief Brody and Hooper, he was out to catch the great white shark that terrorized Long Island. One story that really sticks out to me was in 2010, I was meeting up with Chris in New York to pitch our book to my agent at the time. He showed up late in a trench coat with a black eye, explaining to us that he defended a woman’s honor at a bar in Rhode Island a few nights before. He hadn’t slept in 2 days. He then told us he was late getting to the meeting because he was at Katz Deli, waiting in line to get a sandwich. He was stampeded by a large group of folks and dropped his tray. He turned around to see Paul Reubens dressed full on as Pee Wee Herman, randomly showing up to promote his comeback. After the meeting didn’t go so well, Chris and I were hanging out in lower Manhattan. He was telling me about the time his old band was playing a show at CBGBs. After the show, they saw this crate opening in the streets with no locks. He opened it up and wandered the underground of New York like a Ninja Turtle. He stopped in mid story and looked up. 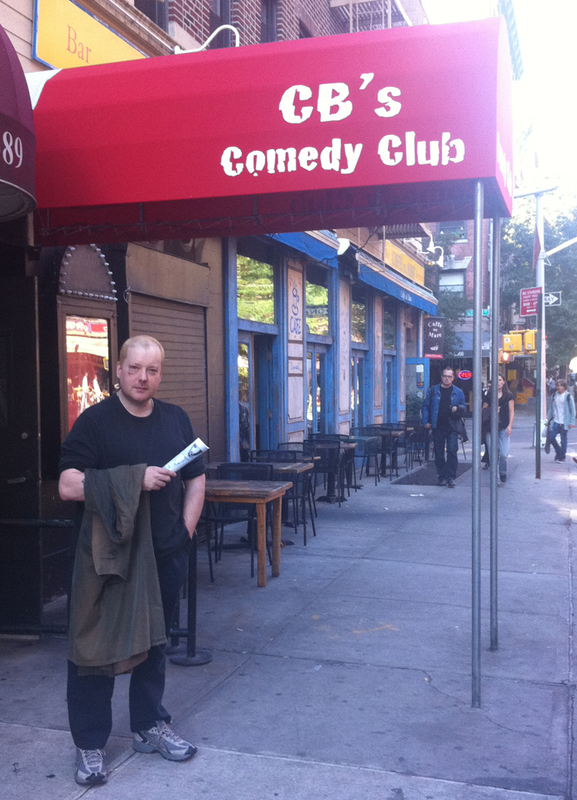 He realized he was under the CBGB sign and was standing on the opening of the underground entrance he had gone into 20 years ago. When Chris died, we were finishing up a comic book about a mysterious fisherman, a carnival of circus freaks, vampires and an unsolved murder among other things. I’m still piecing together how the story is supposed to end. I met Chris a few years back at Comic Con in San Diego. That was when he asked me if I wanted to do the art for a very personal book he was working on called Fish Tent, later renamed Josh Lobster. As things go in comics, life got in the way for both of us and I am only now finishing up the final art for the book. The last conversation we had, he was telling me about the crappy day he was having but some local Crips had given him a ride home and they were really a bunch of sweet guys. At the end of the conversation he had me laughing and he was laughing. We once again talked about our love of Jaws and how excited he was for San Diego Comic Con next month.